The Glyn Newydd homestead and cottage can be found 17 km south along Megalong road, overlooking the beautiful Megalong Valley with escarpment views. This stunning accommodation is set on a 40 acre property which includes an organic olive grove, green paddocks with horses and an abundance of australian wildlife. All this only 15 minutes away from Blackheath and 2 1/2 hours from Sydney. The main house (homestead) has 3 bedrooms & 2 bathrooms and the house is heated by AGA/central heating and a fire place in winter, the thick walls and wrap around verandah keeps the house cool in summer. The cottage has 2 bedrooms and is heated by aslow combustion wood heater in winter. Glyn Newydd offers you everything you need to enjoy your stay. Take in the early morning sunrise over the valley and spot the kangaroos or enjoy a glass of wine watching the colors of the escarpment change to orange and red as the sun sets. We grow olives on our property, they are grown the organic way (but not certified, too expensive for a small grower). There is usually a variety of produce available at the homestead for you to buy using the honesty system. For those who are more adventurous and active, you can explore the property and get to know the horses or walk your dog (yes , we are per friendly !). The valley offers a great variety of bush walks and has some of the best horse riding in the blue mountains. The Homestead offers three large Bedrooms. The large main bedroom offers a queen bed and ensuite including shower and toilet. The other bedrooms include one queen sized bed and two single beds. For larger groups or two families, we can offer to include the use of the Glyn Newydd Cottage (only in combination with the homestead) . The cottage offers two large double bedrooms. The large main bedroom offers a kingsize bed and ensuite including shower and toilet. The second bedroom offers two single beds and an ensuite bathroom with toilet and shower. Fully equipped kitchen including a stove/oven, microwave, dishwasher and fridge. A large basket with toys and a great selection of board games and puzzles. 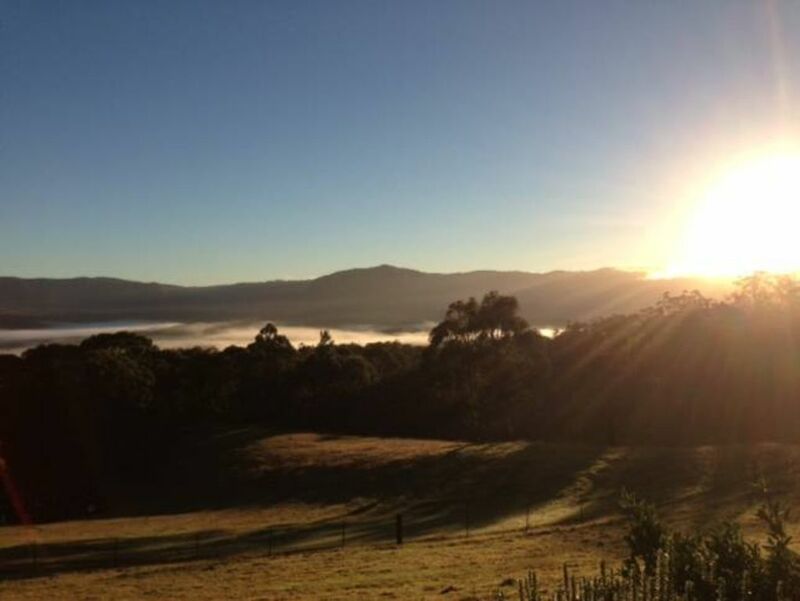 Take in the sweeping valley views from the homestead verandah, while you fry up a gourmet farm breakfast on the gas-Weber BBQ. We are pet friendly, your dog can have a holiday too!! But take care around our horses, they will not tolerate dogs chasing them, so best to keep your dog on the lead near them. And the local wildlife will also need to be protected from chasing dogs, it is the owners responsibility to control their pets . We are a family of 5, with a Dutch back ground, but all children are all born here in australia We lived in the homestead for the first 7 years we owned it and our children went to Megalong public school. We used to rent out the cottage as a bed & breakfast. Since then we have moved to sydney and have been renting out the homestead and cottage successfully for years. Many of our guest are returning every year or more then once a year as they have fallen in love with our beautiful place. Glyn Newydd and the Megalong valley found us. We never thought we would live in the country until we spotted this unique place on a Sunday afternoon drive. Glyn Newydd homestead and cottage are position on top of Megalong Road on a 40 Acre property with an organic olive grove. The view is true breathtaking and changes all the time. Watch the wildlife from our veranda: kangaroos, goannas and wombats or meet our friendly horses in the paddock. Enjoy the quiet and listen to nature; a real treat when you live in the city! Thank you for having us, abosolutly beautiful property and scenery. Loved the horses next door too. Great for a family vacation or a weekend getaway! Such a breathtaking view! Lovely rooms to take advantage of the aspect. Thanks for sharing your lovely homestead. We'd love to come back! Thanks for your lovely feedback Rachel. Great to hear that you enjoyed your stay at our homestead! Apologies for the mix up with the keys. We figured out what happened and have corrected this for the future. We booked a few months ahead for 9 people so that we could all be there mid September. Firstly, the views of Megalong and the escarpment from Gyn Newydd are absolutely spectacular. Reading the visitor's books back to 2001 - no one doesn't say that, but the trio of homestead, cottage and view means you just have to say this! Finding Glyn Newydd wasn't hard and everything in the homestead was set out for us nicely. Most of the kitchen and cooking gear were in place and ready for us to enjoy 3 meals a day while exploring some of Megalong Valley. Bedroom accommodation was perfect for 3 couples and single beds were comfortable for rest of us in the cottage. The homestead and cottage setup and decor made us feel at home. We were lucky to have 3 perfect warm September days with no wind, making the comfortable lounges on the homestead veranda the place to be for most of the day. You cant take your eyes of the view! The ambiance was also great with lyre birds, bower birds, maggies and honey eaters singing morning and evening, leaving the middle of the day quiet and very peaceful. The fireplace in the homestead kept us cosy in the evening while we enjoyed the selection of music which was just our style. The great weather at night allowed us to enjoy a camp fire down in the paddock, lit by a full moon and a clear night. Thanks to Robert and Eveline for the work you put into making our stay comfortable. A wonderfully tranquil experience in a magnificent environment. A weekend away in the country; quiet, beautiful views and a very cosy house. We stayed at GlynNewydd for a celebration birthday weekend and enjoyed every minute. We loved the fireplace and the big verandah full of sunshine all day. The perfect spot to sit and take in the view across the valley and escarpment. So much space to spread out and do nothing or a lovely area to walk amongst the bush and olive grove. The house was very clean. The beds were comfortable and the house was well equipped with everything you might need. This is a homely house with character. We loved it. I just wanted to touch base (on behalf of all my family) to thank you for having at stay at your house. The weekend was wonderful, my Dad had lovely 60th and we all commented on your beautiful property and house. My daughter aged 7,doted on your horses morning, lunch and evening...pretty much 24/7. They are gorgeous, very friendly. She even brushed them several times which they appeared to love. Do you still ride them? We went (some of us) for a trail ride at Megalong Farm and had many walks on your property. Both houses were wonderful, thank you for having the fire pre ready for arrival. Again, we thoroughly enjoyed our relaxed time at your property. We hope to come back again for another stay. Glyn Newydd property is situated in the Megalong Valley, a truly unique valley in the Blue Mountains. The valley has kept its rural character. there are a few bushwalking worth while doing during your stay: the 6 foot track is well know. you can walk the track either east or west from where it crosses Megalong Road, 3 km from Glyn Newydd. There are 2 wineries open most weekends along the 6 foot track. Horseriding is available at Megalong farm and Euroka. Megalong creek 3 1/2 km down the road is nice for cooling down and picnics on hot summer days. The Megalong tearooms is open for breakfast and Lunch 7 days a week.